One Day · Un Día. San Antonio de Arredondo, Córdoba, Argentina:: Alex Appella,, 2018.. Open Edition. 8 x 10"; 26 pages. Bilingual text (Spanish - English). Bound in illustrated wraps with hand sewn binding. 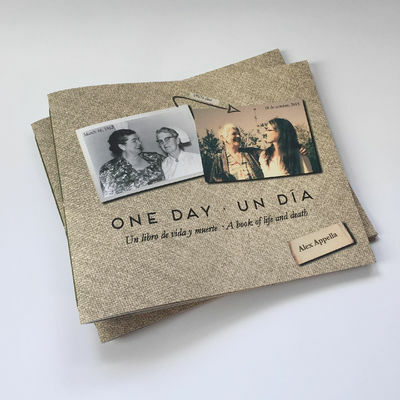 Barbi Couto, journalist and editor in Argentina : "'One Day · One Day' is a book about death and also about hope. The bilingual collages document/portray the raw, loving, brutal, sensitive, intense story of the last day of Alex's grandfather's life, which he photographed without knowing it, and the last days of her mother's life, as she succumbed to Leukemia. Trying to describe the book in its poetic and visual depth may be as difficult as trying to describe the feelings and emotions surrounding the departure-farewell of a loved one.